2008 Robller Vineyards Norton | Wine Splash! This is one serious wine! One that can compete with the Cabernets, Merlots, and Cabernet Francs of the world. And you rarely (if ever) hear about it unless you visit Missouri, Virginia, or the Carolina’s. This is the Norton grape variety and it is one that you need to put on your Wine Bucket List. Now we haven’t tasted all Norton wines from around the country but this one from Robller Vineyards in Missouri is a great choice! In our glass, deep garnet color with ruby highlights along the edge. Wonderful aroma’s of briar berries, spice, petrol, and vanilla oak burst from our glass! The mouth feel was full bodied, velvety, with a medium tannin structure. Flavors of spicy blackberries, ripe plums, oak, and herbs danced on our palates! As the wine opened up a bit more, subtle notes of tart cherry and vanilla oak led into a long, elegant finish. Wow, what a ride! This wine would pair well with most grilled red meats, sausage, ham, or a spicy vegetarian meal. We love our Cabernet Sauvignons, Merlots, and Cabernet Francs but it is nice that there is something else out there that is different and can be just as enjoyable! 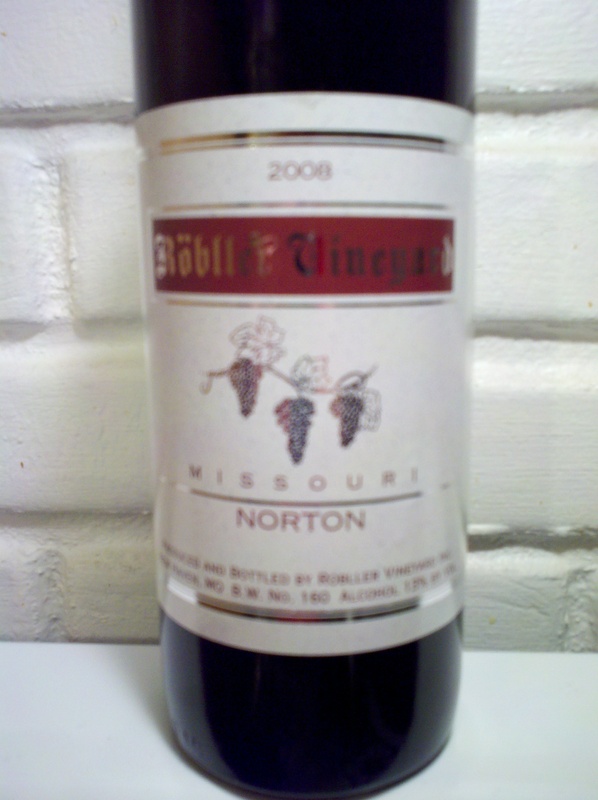 We have been to many wineries in Missouri and found some wonderful Norton wines and some that are just so-so. The 2008 Robller Vineyards Norton is superb and we give it a 91 point rating! Wonderfully complex, rich, with a good balance between fruit and non-fruit flavors. Check them out at http://www.robllerwines.com. If you have a 2008 vintage of this wine, we would drink it by 2014. WineSplashing! !